Pale yet lovely, glazed and beautiful. The French Revolution at the end of the 18th century had a great deal to do with bringing hair fashion back down to Earth. 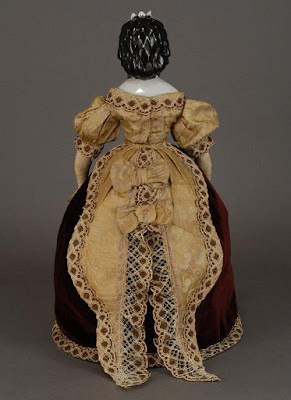 Europeans and European-influenced countries saw the final triumph of undress or informal styles over the brocades, lace, periwig, and powder of the earlier eighteenth century. There was a return to the classical Greek hairstyles, with hair dressed closer to the head and fillets or bands of ribbon worn by women. 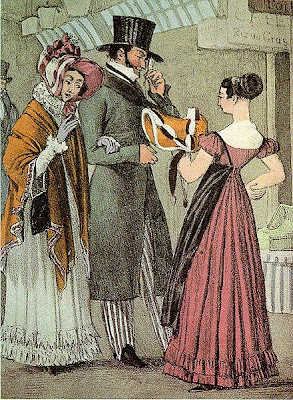 No one in Europe wanted to appear to be an aristocrat, while in Britain, Beau Brummell introduced trousers, perfect tailoring, and unadorned, immaculate linen as the ideals of men's fashion.Women's fashions followed classical ideals, and tightly laced corsets were temporarily abandoned in favor of a high-waisted, natural figure. 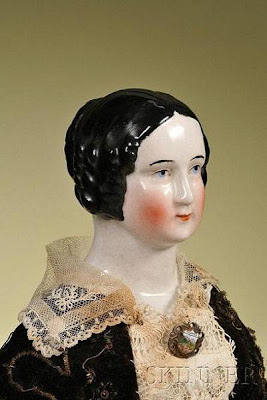 From the late 1830s to the mid 1860s women commonly wore their hair parted in the center, looped or draped in front of the ears and neatly bunned into a low chignon at the nape. 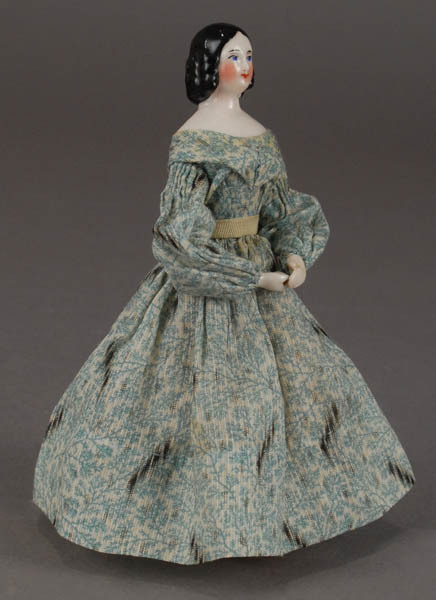 This style was modest and neat, emphasising the width rather than height of the face, and was often worn with a lace cap. Queen Victoria and Melanie Wilkes (in the 1939 Gone With the Wind film adaptation) both wore this iconically demure hairstyle. A variation on the theme was to add a real or false braid across the top of the head, just visible in front of the cap or hat brim. 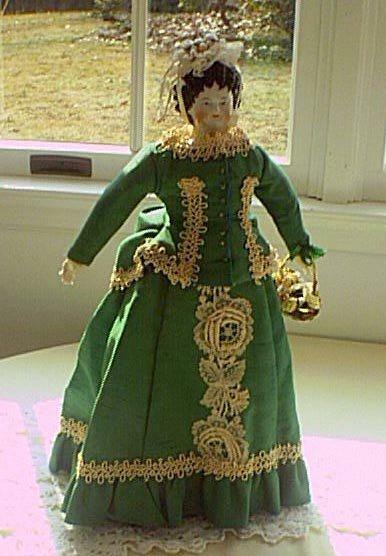 In the 1870s women wore ringlets at a ball. The hair was curled and arranged at the crown, with longer ringlets falling down the nape of the neck; often false curls would be added to the updo to increase its bulk. The front hair could be pulled straight back, parted in the center or worn as short curled bangs. 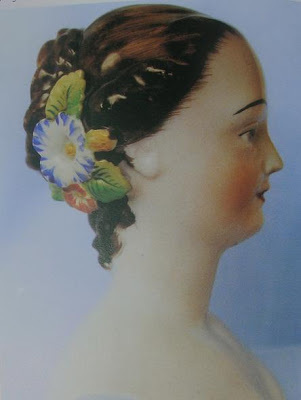 Combs and other hair adornments were all the rage in the mid-1800’s. Women loved to decorate their hair with brooches, tiaras and all things sparkly. Interestingly, most of the hair ornaments from this era had detachable fixtures so that they could double as a brooch or pendant. 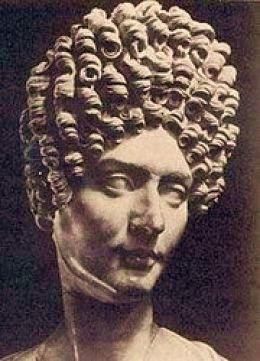 First Century Roman Woman statue shows ringlet's popularity even thousands of years ago. Ringlets are closely associated with many eras, the large long neck draping ringlet of Marie Antoinette's 18th Century France. 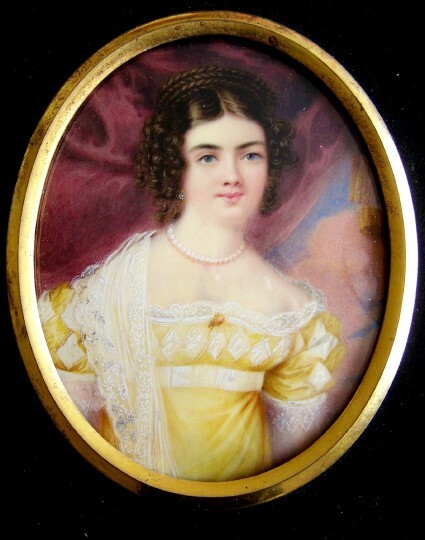 The petite forehead and before-the-ear ringlets of the Federal (USA), or Regency (England) eras of early 19th Century. The ponytail full of ringlets of the Victorian era (mid 19th Century), and so on to this very day, although ringlets now usually reserved for special occasion hairstyles. 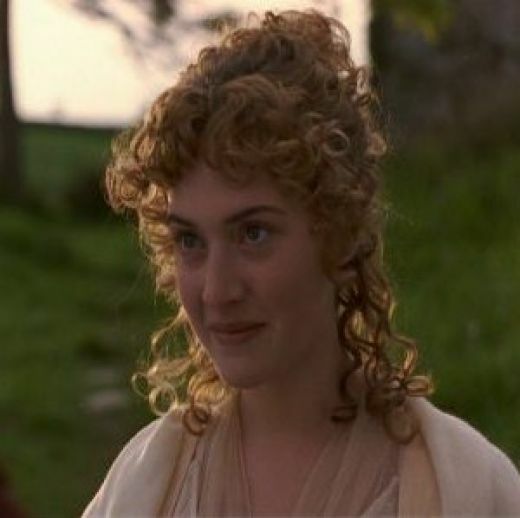 Although Jane Austen’s novel was set very late in the 1700s, the hairstyles from the BBC adaptation are appropriate for the early 19th century as well. A variation on the Queen Victoria look, this style emphasises the width of the face. 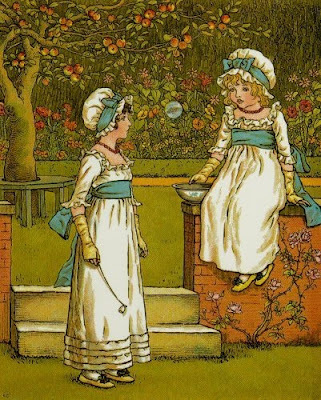 The hair is center-parted and worn in bunches of ringlets at the temples, while the back hair is worn in some kind of chignon at the crown of the head. 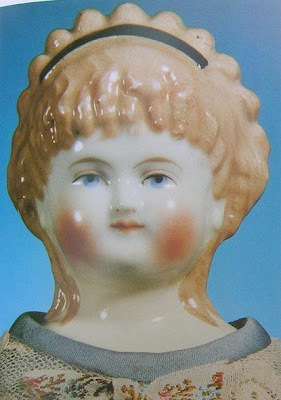 Alt, Beck and Gottschalck china shoulder head doll. The facial features include blue painted eyes, partially outlined in black, exposed ears and well blushed cheeks. 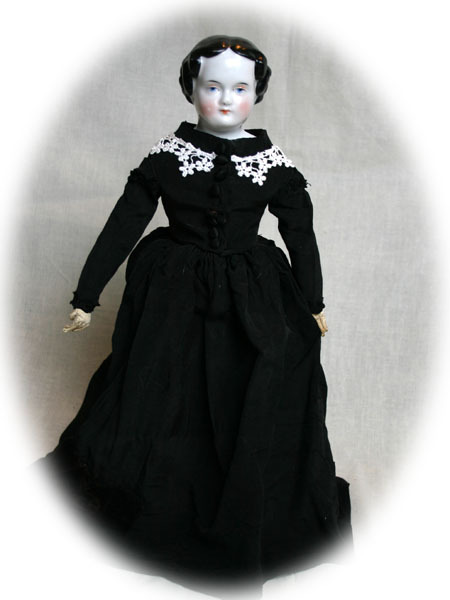 The doll has two large molded curls on the forehead. 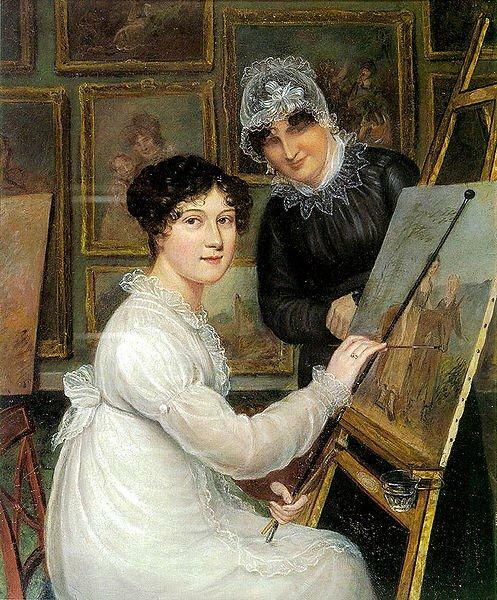 In the Mirror of Graces, a Lady of Distinction writes….Now, easy tresses, the shining braid, the flowing ringlet confined by the antique comb, or bodkin, give graceful specimens of the simple taste of modern beauty. 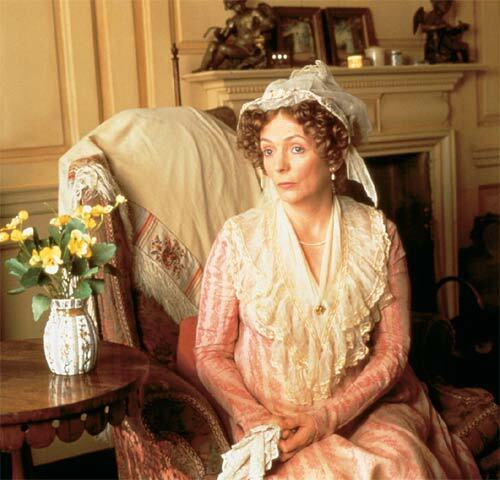 Nothing can correspond more elegantly with the untrammeled drapery of our newly-adopted classic raiment than this undecorated coiffure of nature. During this period, the classical influence extended to hairstyles. Often masses of curls were worn over the forehead and ears, with the longer back hair drawn up into loose buns or Psyche knots influenced by Greek and Roman styles. 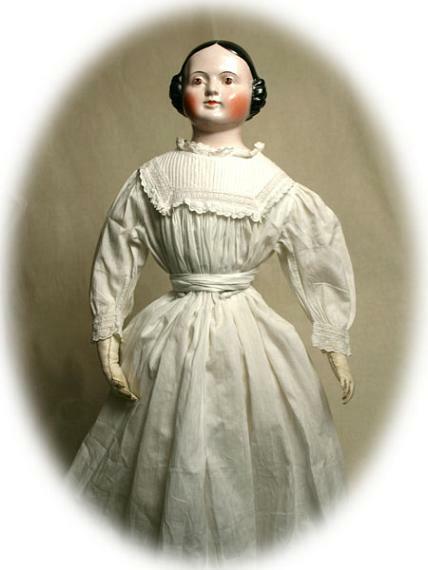 By the later 1810s, front hair was parted in the center and worn in tight ringlets over the ears. Ringlets have been popular for thousands of years, since some woman first realized that by gently heating a rod with a candle's flame and wrapping hair around it, she might not burn her hair off, and she just might get a gentle feminine curly ringlet. Then, of course, she realized that she'd need a maid or two to maneuver around her entire head and keep a series of rods warming and at-the-ready to create a head full of ringlets. Women's styles concentrated on variations of a topknot with hair framing the face at the temples. At the beginning of the century, women abandoned their huge powdered wigs to twist their hair into Apollo knots and adorn their heads with Greek inspired wreaths, jeweled ornaments, flowers, and strands of pearls. 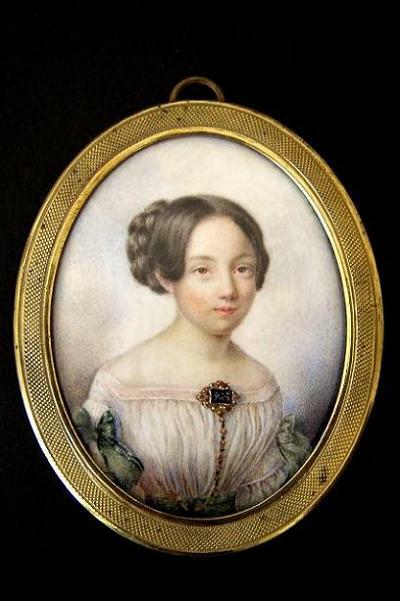 As the century progressed, women's hair continued to be worn swept on top of the head, but the styles became more ornate. 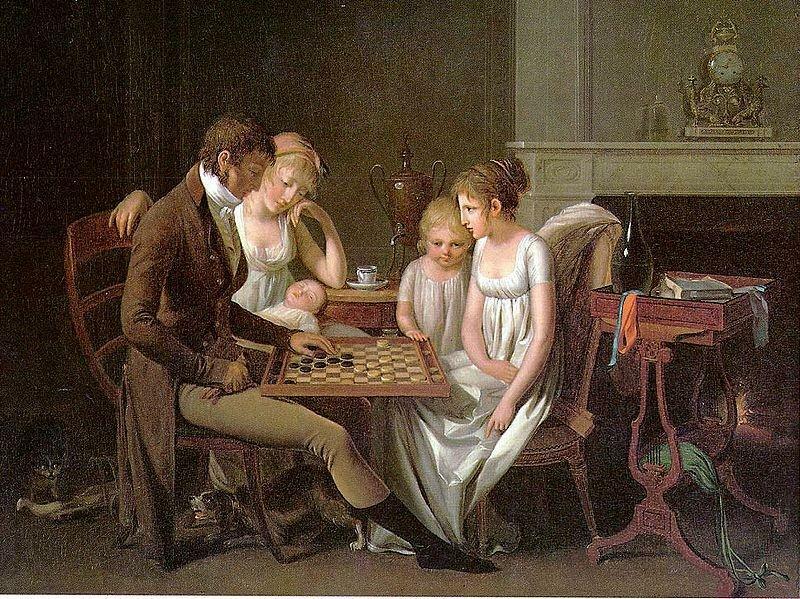 Their hair was greased, braided, and twisted into elaborate knots with curled or frizzed hair at the sides. Women's hairstyles had become so elaborate by the end of the century that wigs were back in demand. These elaborate styles provided many poor women with needed money, as they cut their hair and sold it to wigmakers. 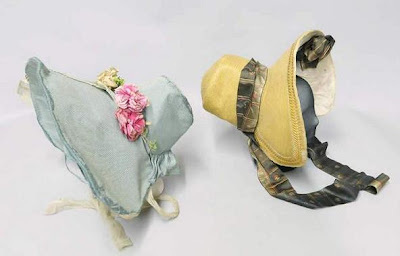 Caps, mob caps, and veils were made of lace, white linen or delicate muslin, and trimmed with ribbon. They could be ruffled, embroidered, or plain, depending on who wore them and their status. Conservative married women continued to wear linen mob caps, which now had wider brims at the sides to cover the ears. Fashionable women wore similar caps for morning (at home undress) wear. No respectable woman would leave the house without a hat or. 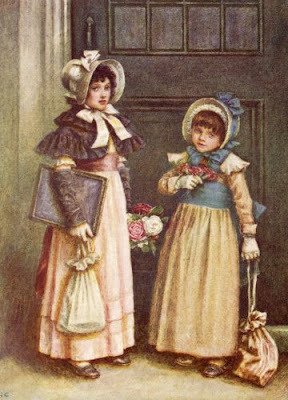 As for bonnets, their crowns and brims were adorned with increasingly elaborate ornamentations, such as feathers and ribbons. In fact, ladies of the day embellished their hats frequently, replacing old decorations with new trims or feathers. The most widely used hair preparations of the century were Macassar oil and brilliantine, whose functions were to give hair shine. In general, hair fashions changed faster as news traveled faster from one country, and even continent, to another. The simplicity of the smooth, center-parted styles worn by women in the Victorian era lasted until the 1870s, when the Parisian hairdresser Marcel Grateau created a new, natural-looking wave by turning a curling iron upside down. 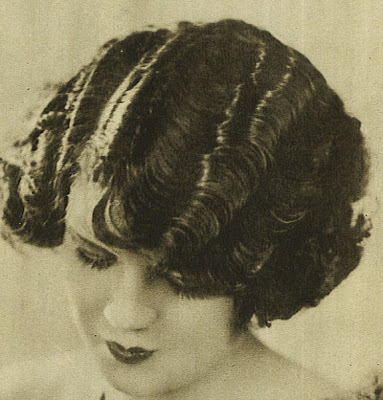 The Marcel wave remained popular for almost half a century and helped usher in a new era of women's waved and curled hairpieces, which were mixed with the natural hair. Another major innovation at the end of the 19th century was the invention in 1895 of the safety razor by an American, William Gillette. Barbers now concentrated on cutting hair and trimming beards and mustaches, and a new age of at-home grooming practices began. Thanks for the great post on hairstyles down through the ages. I am working on a few dolls and I am new to the whole doll making thing but I do want something old fashioned but not too fussy. This gave me some ideas, thanks so much! Thank you Tina...I'm glad this was of some help to you. What a lovely, informtive post. 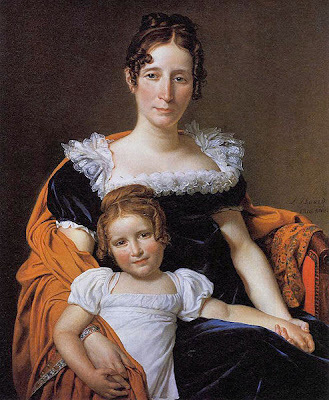 I must look more carefully at portraits and family groups. Children's clothes are interesting too. my heart beats higher, when I see those pictures. It was a time, that women were still women. With the attention to everything that belongs to a woman. Those beautiful dresses- and I love those hairstyles, too. ps- I googeld the style of Diane von Fürstenberg- and I agree- her face has got similarity. Muy interesante e instructivo, como siempre. 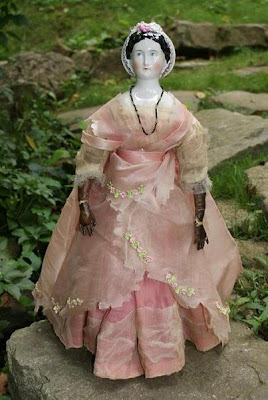 I loved the Conta & Boehme doll, really beautiful! 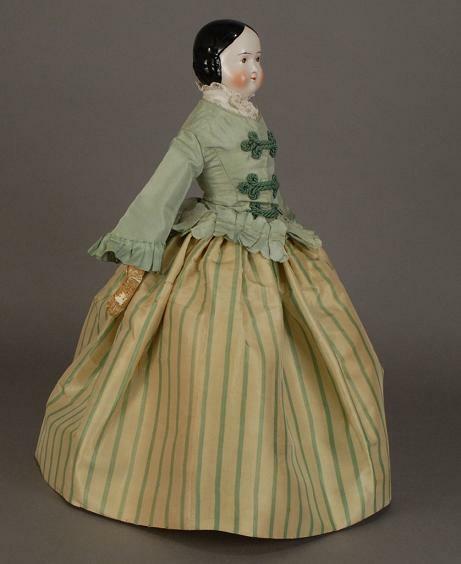 I agree about the interesting clothes, I think the Empire styles were so femenine and beautiful. I'm glad you still see that style down the Red Carpet sometimes. Its timeless! Thank you Ines....Beauty and femeninity was what you strived for. I love the frailty and sweetness that women exuded in those days, the innocence even. Of course the beautiful dresses and hairstyles added to the feeling. Thank you my dear friends...I am thrilled you found this post interesting. It was exciting gathering all the information. The many beautiful period films that have taken pains to portray these fashions to every detail, were a big help. Thank you Flora... So pleased you like the post. I hope you find your Sissi dress. Those fashions were very becoming for the women. They celebrated women's beauty. Yes- that´s the key- femeninity is this, what I miss in our time... You described it wonderful :-) The women now wanna be like a man- in the job- daddy is at home with the kids and mummy goes to work. A twisted world. In the past the man was busy and the woman at home to welcome him, when he´s back again. I like that way more and I am at home in December for 18 years with my kids. The past feeling is lost- a shame! I do miss that... Especially coming from Cuba a country that used to be "genteel," during the 50's. I grew up with lovely women; my mother, and grandmother. My father was our hero and he doted on us....Paradise lost. Que Gran reportaje querida Marta ! Me fascina El Mundo de los peinados , Las modas y Los sombreros y Las Adaptaciones un Las Muñecas de La Época y La Vida ... tan familiar Diferente en La Actualidad . Gracias a Dios Tengo la posibilidad de Esperar Por Mi Esposo y mis hijos en casa ... pero mi peinado es Más simple. Si tienes razon, la vida es muy diferente ahora, la mujeres eran devotas a su marido, hijos y hogar. Ahora sus carreras tiene precedente. 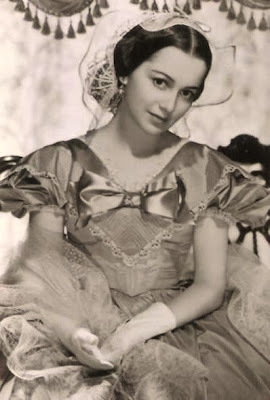 Yo creci en los 1950's, y todavia en esa epoca esa era costumbre. Pereo si me acuerdo de los "Permanentes" en el cabello que eran populares. Me ha encantado, Marta! Sólo siento no haberlo podido leer antes. Fascinante como siempre. Me maravilla esa época. Me gustan muchísimo esos peinados, como habrás comprobado por mis dibujos. 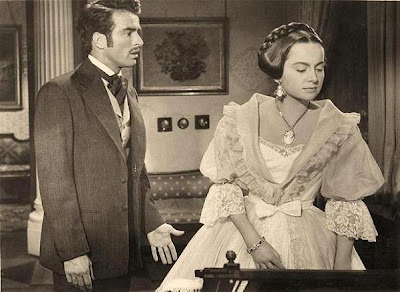 Las trenzas, moños... Me encanta ver personajes como Jane Eyre en las adaptaciones para el cine y la televisión. Como se vestían y peinaban... Ahora, cuando voy en el metro, me gusta observar a la gente. Ver como se peinan las mujeres hoy en día, me indigna muchísimo. No hablemos de la ropa! Todas quieren ir con un pelo cómodo, pero vulgar. ¡No como tú! Estás guapísima con tu pelo! Son un placer todas esas bonitas imágenes. 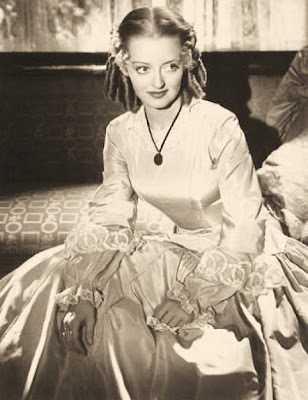 Las fotos de Bette Davis Olivia de Havilland, son gloriosas. He disfrutado mucho, Marta. Lo cual, no es una novedad. ¿He utilizado un vocabulario correcto? ¡Espero que sí! Besos y muchas gracias por alegrarnos el espíritu. Yo pense que este post te iba a interesar. Me maraville cuando encontre esas fotos de Olivia y Bette. Se ven tan preciosas las dos. GraciaS tambien por esos elojios, yo no estoy tan convencida como tu, pero bueno! Thank you Marta for the beautiful photos. 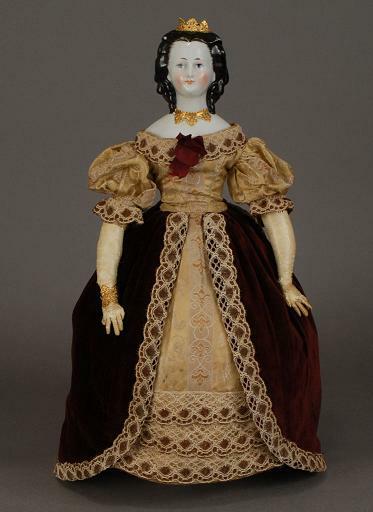 The Goebel and "Morning Glory" dolls with flower-adorned finely molded hair have such a sweetness and grace. I found it interesting too that hair accessories were made to double as brooches or pendants - so practical. 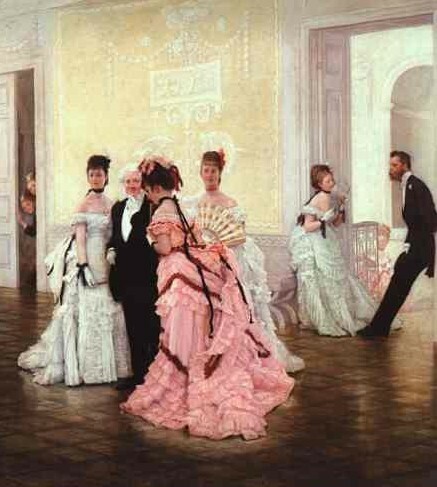 I love the style of the portrait of "Mr. and Mrs. Charles Henry Carter" too! It leads the eye to centerpoint,then outward like a sunburst. Fashion is a part of history we cannot omit. Just like some popular fashion historians say: women are vague and so do the men, it is just that women are more outspoken with it. And fashion is not just about the dress, because we tend to forget the boots, and so does the wig. The popularity of male hair replacement systems during the late 90’s is still alive nowadays, and I believe it will live hence to another generation. Fashion is just a cycle; one moment it’s gone, and another it’s in your time again. Thank you Tara...You are so right, and yes fashion goes a full circle and repeats itself. I love vintage 30's fashions and Art Deco jewelry. Thank you so much for your insight and for following.